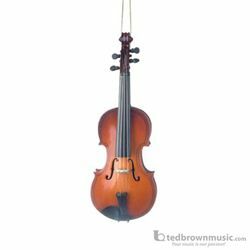 Miniature Violin ornament adds a special touch to any Christmas tree or room decoration. A perfect gift for anyone who plays the Violin. The intricate details include the chin rest, strings, f-holes, and neck leading to the tuning pegs and trademark scroll. A beautiful instrument miniature perfect for any wreath or window decoration. Approximate size is 3"